From pristine lakes to creviced ridgelines to stunning autumn vistas, as a traveling wind turbine technician, welcome to my world. I enjoy not having a set location. I love the independence, the travel and the camaraderie with my crewmates. So how did I get here? Fresh out of high school in 2012, I didn’t have a clue what I wanted to do. So I considered what I loved – the great outdoors. I also knew whatever my field of study, I wanted to make a positive impact on the planet. With those values, I decided what better career path to follow than renewable energy? As a wind technician, scaling 200- to 300-foot wind towers is a regular aspect of my job. So is travel. I took a tour of Mitchell Technical Institute in Mitchell, S.D., and found out it has a Wind Turbine Technology Program, comprised of courses on electricity, AC/DC theory, hydraulics troubleshooting and other skills. Totally impressed, I enrolled. Two years later, a bright career began. One of my first wind projects, in west Texas, is also one of my most memorable stops. Full of cotton, cacti and flatlands, it may not be for everyone, but I loved it. An endless horizon produces beautiful sunrises and sunsets, putting Texas easily in my top five favorite states. There aren’t many places where you can see a pitch black sky full of stars while witnessing the sun still sinking under the horizon. 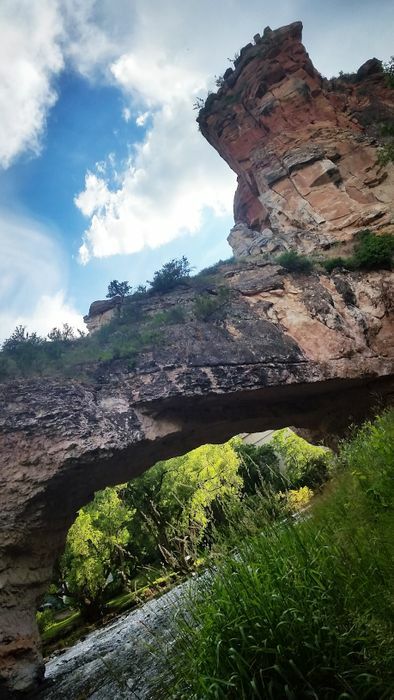 Natural land bridge in Wyoming. Another captivating moment was from a mountaintop venue in the Colorado Rockies. I got caught in a violent storm and watched as a wall of hail came across a nearby lake. As I sat there, I thought how amazing it was that my career brought me to one of the most beautiful places in America. While there, my crew and I also found time to discover lakes and streams to test out our amateur fly fishing skills. Right now, I wouldn’t change my career as a wind turbine technician for anything. I’m young, and I get to see incredible parts of the country. Last fall, I worked in Pennsylvania, where being perched 300 feet in the air provided the perfect setting to soak in the fall colors. Despite the physical nature of the job, it’s becoming more popular every year. With the growth of wind power, more technicians are needed. The Department of Labor predicts the profession will grow by over 100 percent in the coming years. As wind farm construction continues for the foreseeable future, there will be numerous opportunities for people who would like to follow my path. 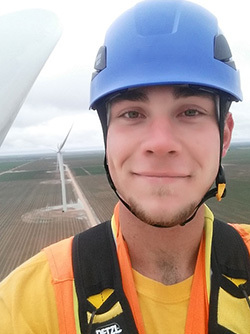 If you’re not afraid of heights, enjoy driving across the country and are mechanically inclined, I highly recommend working in the wind industry. It’s opened many doors for me and put me on a path for a deeply satisfying career and successful future. Duke Energy Renewables operates 18 wind farms with 1,400 wind turbines across six states and employs 175 wind technicians. The technicians also provide operation and maintenance support for 16 additional wind facilities through Duke Energy Renewable Services.